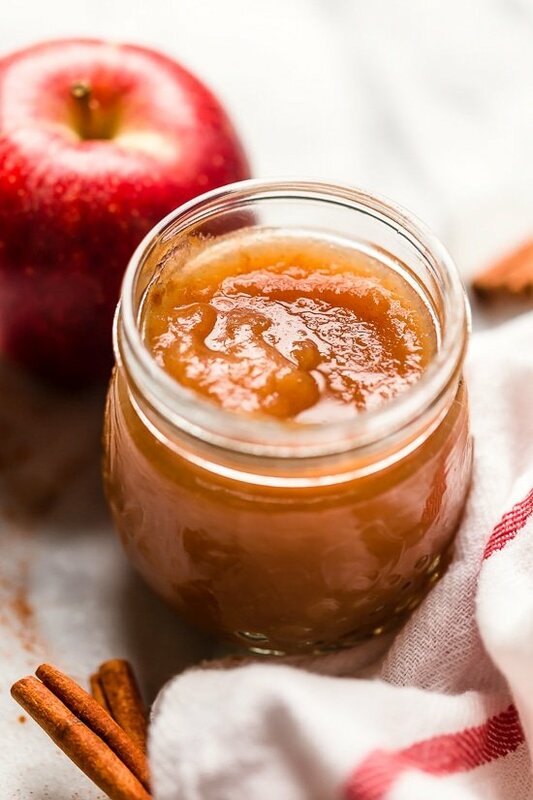 Crock Pot Applesauce – Homemade apple sauce doesn’t get easier than using your slow cooker!! 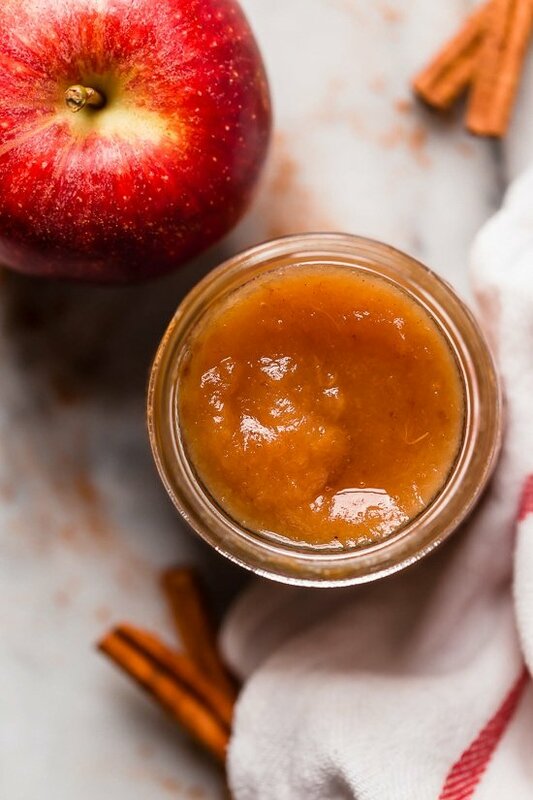 Nothing beats homemade apple sauce, making it in the crock pot is easy and your house will smell divine while the apples and cinnamon simmer all day long. The hardest part about making this sauce is peeling the apples (which is not hard at all!). I love using it in my homemade Applesauce Nut Bread, or with Pork Chops and Apple Sauce, so good! Start with apples. I love using a variety of apples to make applesauce, for this recipe I used eight different apples; Honey Crisp, Fuji, Gala, Macous, Red Delicious, Golden Delicious, Braeburn, and Granny Smith. Gravenstein, McIntosh, Jonagold and Jonathan would also be great options. I use just a touch of sugar, but if your apples are sweet and you wish to make apple with no sugar, it will still be delicious. 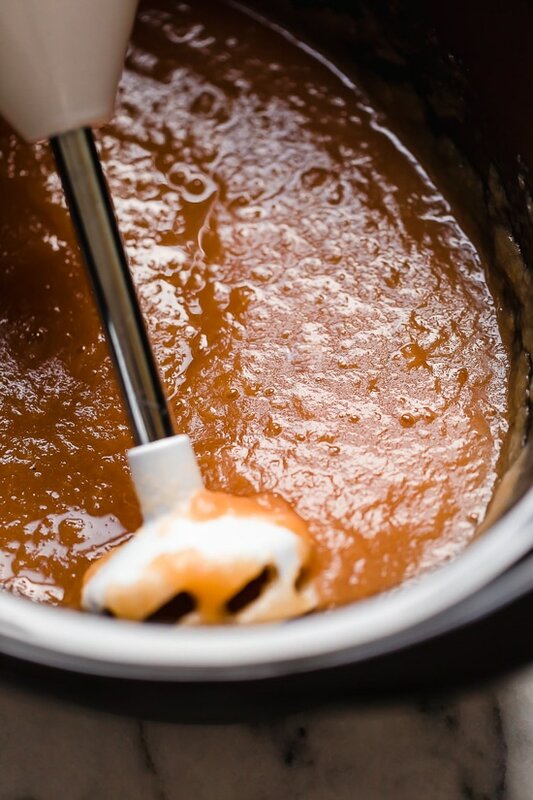 Homemade apple sauce doesn’t get easier than using your slow cooker!! Add the cinnamon stick, lemon peel, lemon juice and brown sugar. Set crock pot to low and cook for 6 hours. Stir apples occasionally, apples will slowly become a delicious applesauce. Remove cinnamon stick and use an immersion blender to blend until smooth or if you prefer a chunky sauce, leave sauce intact. Hey! Thanks for this recipe. Turned out great. I didn’t have any cinnimon to hand so I used pumpkin pie spice insead and it tastes AWESOME! I made this because I had some apples that weren’t getting eaten and a few pears. This is delicious! I can’t wait to make it again. I made this last night and it is delicious just like every recipe I have made from this amazing blog. No comparison to store bought applesauce! I’ve made four batches of this applesauce. It is fantastic! I leave it chunky and eat it for a low-point dessert. Note: There is a slight error in the recipe; it calls for one tsp lemon juice, but nowhere in the recipe does it say to add it at any step. Not a problem for an experienced cook, but you may want to update it for newer cooks. Thank you! Just clarified the directions. Did you add any water to the Instant Pot? 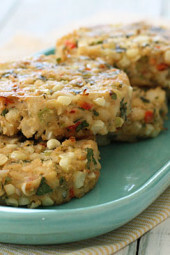 Would love to make this to go with pork chops but don’t have 6 hours to slow cook. All I can say is “wow”. This applesauce is amazing. I used 4 varieties as suggested and the flavor is amazing. Next time I will triple the recipe and can it for gifts!! Could you make this in the instant pot? And if so how long will it take? I want to make this in my classroom to teach about how heat changes things. Thanks! I don’t have cinnamon sticks. How much ground cinnamon can I use as a substitute? I just made this recipe and I love it! Taste almost like the applesauce my mom use to make when she canned. So much better then store bought applesauce. I am definitely going to make this again in mass amounts. My kids just love it! Made this applesauce recipe last night. Used 8 different apples and did not add any augur. Cooked on stove top and reduced heat to lowest setting for two hours. Delicious! This came out delicious! I used all organic ingredients- so much better than store bought applesauce. This is by far the yummiest thing I’ve ever made with our crock pot!!! I absolutely loved the flavor of this warmed applesauce as a dessert and as a condiment sauce to some pork chops. So so freaking good! Thank you!!! This is a great recipe. I just made it today and followed the recipe exactly as written. It turned out great. It was so easy to make and delicious to eat. I will definitely be making this again. I left the peels on, and it still turned out fine (after pureeing). I skipped the sugar but added a couple of heaping teaspoons of blackstrap molasses. It turned out delicious. It tasted somewhere between applesauce and apple butter. Yum! Just made this recipe in my Instant Pot. Used the pressure cooker because I didn’t want to wait. Used Truvia brown sugar blend and otherwise followed the recipe. It was so easy and delicious, I was eating it still hot out of the pot. Didn’t use a blender, just a whisk. Too easy. Has anyone tried this in the Instant Pot? I made it in the Instant Pot. I put the apples in a steamer basket and set it for 10 minutes and used a natural release. Came out so creamy. Last time I made this it turned out really bitter and I was disappointed. But after reading the comments from another reader, I think it was the lemon rind. This time I left it out and oh my goodness, I am glad I gave this one another shot! It was delicious- we have it with the pork chop which were also aweomse. and I have enough left over for baby food this week! I cut the sugar in half and it still was excellent. Thanks for all you do, Gina I couldn’t live without your site! I am wondering if this apple sauce will freeze? How long with this applesauce last in the refrigerator? 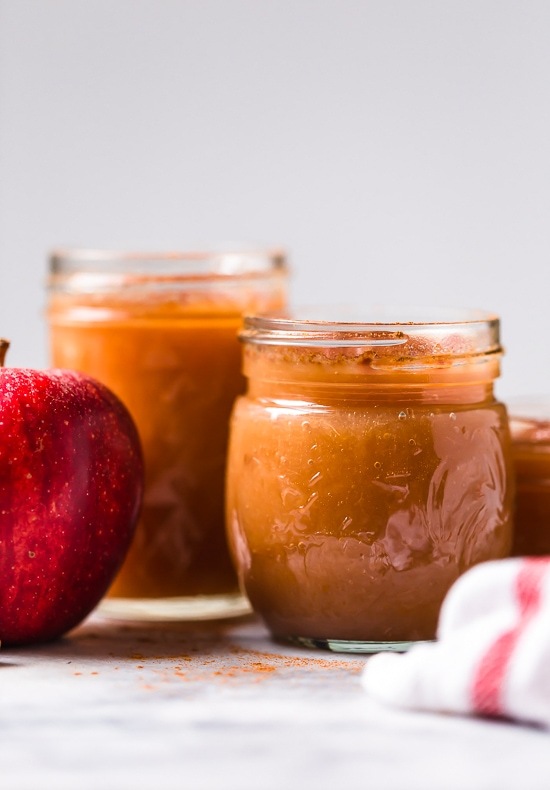 Homemade applesauce can be refrigerated for a week to ten days; it can also be frozen or canned for longer-term storage. 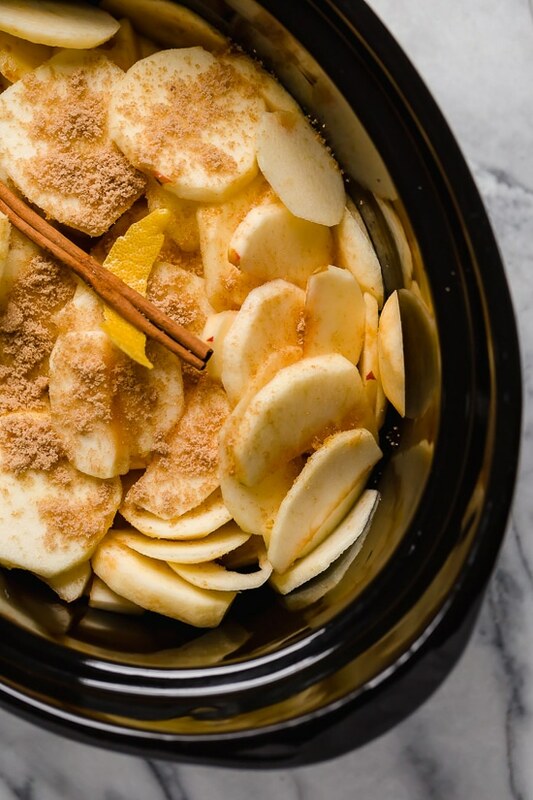 I always make applesauce in the crockpot and it is the absolute best! I put mine in half pint jars and put them in the freezer. Such a treat to eat semi frozen 🙂 Putting a trip to the farm stand for apples on my list today. Would love to try this! How long will it keep in the refrigerator? Can you make this recipe in the InstaPot? Has anyone tried? Yes, I just did. I used the pressure cooker setting on low on the Instant Pot. It cooked for 15 minutes and came out perfect. Didn’t need a blender. Just used a whisk. I really like the sound of this! If I wanted to process it in jars, does anyone know how long and how much head space for processing? Madelyn – I was wondering the same thing, and my “best friend” Ms. Google came up with an answer. This is the link that I found – hope that it helps! Have you tried this in the instant pot? This looks amazing and I plan on making this weekend. Can you tell me how you would suggest storing the apple sauce? Thanks so much — Your website is amazing! You can refrigerate 2 weeks or freeze! I use this recipe all. fall. long. Like can’t stop making it. It’s so good!! I don’t have an immersion blender….can I use a hand mixer? How long is this good for in the fridge? I’m planning on making this as a snack for my 1 year old. Thanks! Just made this tonight and was amazed at how simple and delicious it is. Like other commenters here, I got nervous halfway through cooking when the apple pieces still seemed so solid, but by hour 4 it was getting “saucy” at the bottom, and just now when I took it out of the slow-cooker it was perfect applesauce consistency and so tasty. So I would urge folks not to get nervous and add any liquid because there will be plenty of juice and flavor!!! Hi Gina – I love your stuff! I want to make this with your new latke recipe. How long will this last when I make it? 1 week? Love this recipe. I skip the sugar b/c apples are naturally sweet. I use cake spice from Penzys in place of cinnamon and I do lemon zest instead of a peel. I never grab the same group of apples and it always turns out great! It was great while warm and I can’t wait to try it cold today. Thanks for another winner! This looks absolutely delicious, BUT. Per weight watchers since you blend the apples they now have Points. So bulky the recipe builder this now has a smart point total of 4, not 0. That only applies to beverages, not sauce. I make applesauce using a variety of apples also and have done this for years and years.. I use fresh lemon juice, no lemon zest, a bit of water and then the apples. I leave some of the apples a bit chunky and add ONLY cinnamon to the mixture to taste, OUTSTANDING!!! When you use a variety of apples you really don’t need the sugar. the apples are sweet enough. Is there any way to make this on stove? 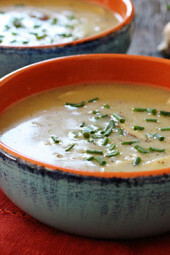 I don’t use crock pot that much and don’t want to buy it just for a few recipes like these. I am trying to put this into my calculator and it is coming up as 3SP instead of 0! Is anyone else getting that when they manually input it?? You have to use recipe builder to get accurate SP. Calculator will be wrong since fruit is 0 but not if you use a calculator. This was a hit with the kids! There has been clarification on blending since the program revision came out. Unsweetened apple sauce is zero pts. The only time you count the nutrition details for vegetables or fruit is when you puree them for a drink like a smoothie or a shake. So if you do not put sugar or honey or maple syrup with the apples, it is still zero pts. Using the new Weight Watchers hand-held points calculator (and the phone app), this calculates out to 3 Smart Points for the serving size listed (1/4 cup). All so confusing! This is delicious, but it is 5 SP, not 0. Because it is blended, it automatically hikes the Smart Points. Gina, I just made the applesauce and it was AMAZING! I did not add the sugar and found it to be sweet enough. I discovered your website recently and have made a dozen items following your recipes. Love the fresh items and avoiding the preservatives. I have become a big fan and have told several people about your website. Today I intend to use your leg of lamb recipe. Thank you for sharing!! I'm glad I stumbled upon this recipe. This will make a good snack for my 9 month old! Made this last weekend and it was so good. Making another (bigger) batch right now! Gina your recipes are great. What immersion blender do you recommend? Love getting your email recipes, so fun to read all !!! wondered about the amount of apples on this one, we have Honey Crisp apples the size of my entire hand that would be awesome in this applesauce however I think 8 would be too many. can you give us an idea what the 8 apples you suggest would measure out as please? I have made this recipe so many times in the past few months. Thanks for an easy, tasty recipe that my whole family loves. Would it be safe to can this? If so, water bath or pressure canner, and how long? How long would it be good? I've made this several times, and everyone loves it so I was thinking of adding it to Christmas gift baskets, but don't want anyone to get sick! Thanks!!! What are the best sweet apples to use. I would like to mix sweet and tart apples so I can use less sugar. Thanks! I used a mix of Mutsu, Jonagold, and Granny Smith. Used about half the sugar recommended. It was delicious!! I make applesauce all the time using a variety of apples, enough water to just cover the bottom of my largest pot, then a little fresh lemon juice, add the peeled, cored, and cut up apples. When apples are cooked, I leave some chunky, I add Penzy's cinnamon, OMG it is wonderful!!! When do you add the lemon juice? I think this step is missing in the instructions. I just added it with everything else. Do you take the lemon peel out after as well? Just made this today! I didn't add any other liquid than what was called for and it came out wonderfully. I left it on low for 7.5 hours (whoops, forgot it was on) and the texture was AMAZING. Delicious – almost jam-like in texture. My husband put it on toast. I think it'd be delicious over vanilla ice cream. My mom used to make applesauce for my kids We used Stayman Winesap, prepared the sauce with the skins on the apples and processed it through a food mill. The best thing about this was the pink applesauce. This was the only applesauce my kids would eat. This was extremely delicious. I made it today for dinner with the pork chops and garlic mashed potatoes and it was so freaking good I want to eat more!! Thanks for this recipe! I tried it today and the applesauce is yummy! I have enough apples for at least one more batch and the applesauce will be used for baking muffins with the leftovers consumed by the kids. Thumbs up from all of us! I have made applesauce for years and never peeled the apples; just washed, cored and sliced them. Not only do you get the vitamins from the peels, but they often tint the applesauce a pink color. I simply put the applesauce through a food sieve when it is done cooking for a wonderful smooth texture. Try adding a little nutmeg with the cinnamon. I do not add sugar, but you can always add a little to taste. My children loved helping make applesauce when they were young, now my grandson does. Absolutely the BEST. Used 5 organic granny smith and 5 organic fujis with NO sugar and 1 tsp cinnamon and a cinnamon stick the night before so I woke up to the smell of warm apples n cinnamon for breakfast. Spoon it over some homemade granola and it's like heaven. How would you go about canning this? 20 minutes in a water bath is what I have been seeing in the Ball cookbooks I have. Lemon juice appears to be optional. I used this as a base recipe to make applesauce for my 7 month old rather than buying apple baby food. I used 5 apples (golden delicious), 3 pears (d'anjou), 1 cup frozen blueberries, and a cinnamon stick. I didn't add sugar and I skipped the lemon peel/juice because I didn't have any. I ran it through the blender to puree it and it came out great! I froze it in ice cube trays then transferred the cubes to freezer bags. I made this overnight and it is so delicious!! I left the skin on the apples and used my immersion blender after it was done cooking to blend them in. I also used a half teaspoon of cinnamon since I didn't have any cinnamon sticks. Yummy as always! 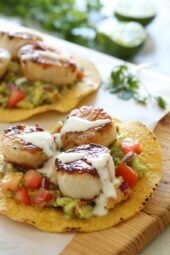 A simply AWESOME recipe and so simple to make! this was such a great recipe! I have a small crock pot so I used 3 large apples (I think they were golden delicious). I did not add any sugar or water and I think my applesauce came out perfectly sweet enough. I turned on the crock pot at low overnight and then blended it the next morning. The last time I made applesauce (2 years ago?) I did it on the stovetop, no added sugar, and used a wire sieve and the back of a wooden spoon to mill it. Yikes! This method is much easier. I don't have an immersion blender, but 30 seconds in my food processor did the trick. I've had the apples waiting for a month this time, and my kids will be so excited! @last Anon–I added no liquid other than a splash of lemon juice. It cooked for 8 1/2 hours on low (double the amount of apples as in the recipe, I think–I lost count!) and didn't burn. It did end up making a couple cups of its own juice, which I blended with it. First and foremost: I love your blog. I found your blog thanks to a friend of mine!! I have used several of your recipes already! I love the fact that your food doesn't taste like diet food! I really love it because, this way my boyfriend doesn't complain that I went with a healthier option. He considers some of them to be pretty bland so he doesn't like it. But when I make your recipes he raves about them and has no idea we just at a skinny meal! I did have one question about this recipe. I was wondering if you needed to add any liquid to this recipe? I love cooking with my slow cooker and as a rule follow the recipe to a T when it says to add or not add water. But, I'm just wondering if the apples would burn? This was very, very good and perfect for the day after returning from the apple orchard. My only issue was that my strip of lemon peel broke apart in the crock pot and I couldn't remove all the pieces. It's a little too lemony for me (and if you get a bite of the peel, a little bitter). Otherwise very good. Just made a batch of this with Mutsu apples we picked at Sky Top Orchard over the weekend… It was amazing! I had a bunch of apples that I needed to use before they went bad, so I made this last night! 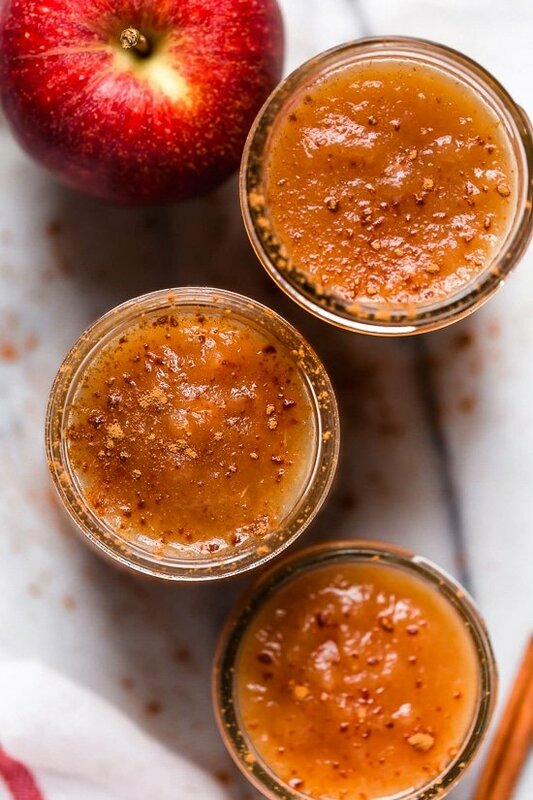 Now, I need to go buy MORE apples because I need to make more of this amazing applesauce! I did use ground cinnamon + a dash of apple pie seasoning in lieu of the cinnamon stick. Besides, I love cinnamon applesauce anyway! I also used lemon zest instead of a strip of lemon peel. My apples were mostly honeycrisp! Anyway, this sauce was DELICIOUS! I mixed some with greek yogurt for breakfast and will be having more for a snack later and even MORE for dessert tonight! First batch, to much lemon, so now I have lemon sauce. Going to try again, this time without the lemon! I'm trying this today with my first graders (in honor of Johnny Appleseed's birthday). They are so excited! I may try this, have been making the sauce on my stove, then using food mill. 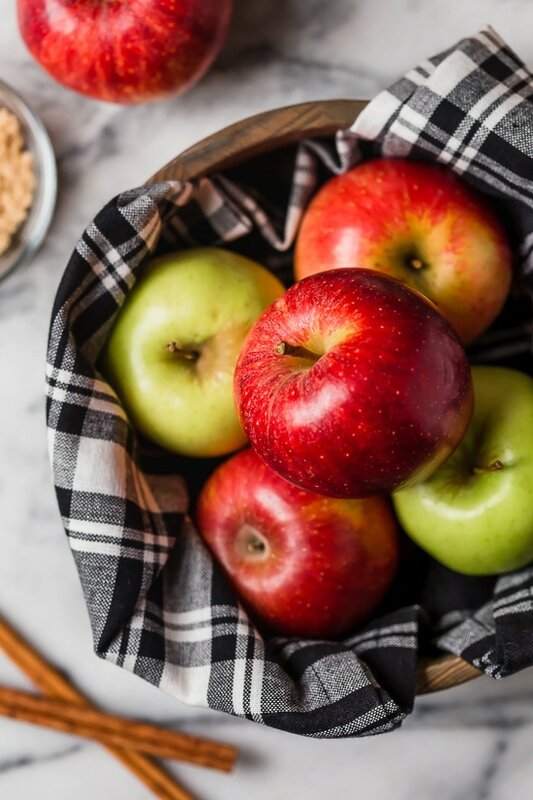 Like cooking with the skin and core, gives a great taste with several varieties of apples. I do not add any sweetener, and freeze in gallon bags so I can later make apple butter in my crock pot, again with no or little added sweetener and lots of cinnamon, allspice, cloves (no measurements, just guesswork). Then I freeze the apple butter in cube form so I can thaw just what I need for a week or so! This is SOOOO good. I made it yesterday but just tasted it today! Yum. I'll be making more batches and freezing. I love your website and recipes! Great recipe — thanks so much! My mother used to do that!! she made the best home made applesauce! Just made this today. Yum!! Can I use this applesauce in your recipes that call for "unsweetened applesauce" or do I need to make a batch without the brown sugar? Thanks!! The apples are all peeled and cooking in my crockpot! I'm having the grand babies over for dinner tonight! They will LOVE it and so will I!!!! Thanks so much for posting! this is in my slow cooker as i type and my house smells amazing! i didn't have the exact ingredients and cut the recipe to only have 2 apples, 1 tsp of cinnamon, squirt of lemon and 2 tsp brown sugar. After cooking 3 hours it wasn't breaking down, only browning, so i added 1/3 cup water, so i'll check in an hour or so to see whats happening. I plan on hand blending it because i don't have a food processor 🙁 and serving it with the Pork chop/apple sauce recipe tonight! its gonna be tasty! much healthier than the other version i was doing before. When I make applesauce in my crockpot, I use enough apples to completely FILL it all the way (I peel and core the apples). I don't add anything except the apples (we like to use just Fuji apples =) Once the apples break apart easily, I run it through an emulsion blender than let it set in a fine mesh colander with a few layers of cheesecloth to filter out all that yummy juice (we like our applesauce REALLY thick) and than I make apple jelly with the leftover juice. My kids don't like store bought applesauce anymore after eating it homemade plus I get the added bonus of knowing exactly what went into it. six hours?? for apple sauce! you must be kidding right? Just an FYI for everyone. I'm pretty sure the points plus for a serving is 2. I put the nutritional information into Weight Watchers ETools to save in my favorite foods and it came out as 2 points. This is a fantastic recipe! I am making it for the second time, and it is the easiest applesauce recipe I've made. I've given jars as gifts and everyone raves about how delicious it is. Thanks Gina for another great recipe! When you jar the apple sauce how long does it keep? I have never jarred anything and want to try this. If I do not have cinnamon sticks how much cinnamon (ground) would I use? Thanks! Love this recipe! My kids are so happy when I make it!